Videos Archives - Mentor Europe . Functional organisation structures have been around for a long time. Everyone understands how they work. Most of us grew up in them; we’ve been trained that way. People who are used to working in functional structures often can’t conceive of anything different – and that’s why they ask why we need to do anything special? Some companies can run certain types of program within the functional structure – that’s undeniable. But they’re mostly straightforward – nothing out of the ordinary. If a program is not complex and functions can pass the baton smoothly between themselves, without dropping it, these programs don’t need any special treatment. The business-as-usual organisation (BAU) can handle straightforward programs with relative ease. Q: So what’s at the heart of the problem? A: When it’s explained to people they tend to get it immediately. It’s not hard to grasp. It’s just a pity these distinctions aren’t made before a change initiative nosedives. In truth, programs fall into two distinct classes – regular and complex; there’s not much in between. While many companies have got to grips with regular, straightforward programs, they still manage to make a complete mess of complex, business-critical ones. But let’s be clear, “regular” doesn’t mean the programs aren’t demanding; they’re just more common. Unfortunately, the term “strategic program” has become a dangerous management catchphrase. It’s widely misused and when an authentic, business-critical program does come along, companies are unable to create any distinction. They treat all programs the same. This simple blunder – often made after a five-minute discussion – triggers a chaotic chain of events that’s almost impossible to stop. A: Programs are called “business-critical” because they’re complex and usually cutting-edge; typically, the future of the business depends on them. They’re awkward and expensive. They demand high-speed interactions between all functions and major suppliers. Execution speed is fundamental to success. Functional organisations could probably figure out what to do in the long run, but they’re notoriously one-paced. They have their processes – and they go through these glacial, slow-moving routines, no matter what. By the time they do, it’s usually game over. Too little, too late. Q: Senior management teams have lots of smart people. Why don’t they see the need for a different approach? A: Some of them are more open-minded than others and often do see the need. But it’s much more common to find executives with deep industry experience who just refuse to question treasured beliefs. Many would prefer to try and squeeze out another paltry increment of efficiency, rather than change their world-view, no matter how many times it’s screwed their lives up in the past. They prefer nothing to change. Often, these status-quo-aholics naïvely believe a functional structure is capable of executing a business-critical program. Q: You clearly believe many top teams have difficulty changing the status quo? A: Past victories – often in the distant past – make people complacent, lazy and blind. This may sound like a harsh condemnation of management teams – wrestling with dizzying levels of change – but it’s true. They often see “change” as something they do to other people – rather than something they should be committed to themselves. It’s rare to find an executive who wouldn’t say their function couldn’t do almost anything. It’s a macho thing - an instinctive reaction but also really bad judgement. You can’t equate the capability of two or three rock-stars at the top of a function with the capability of an entire team. You don’t have to think about this for long to realise it’s absurd. But it’s what many senior managers do; they unfortunately forget there are lots of people in every function who haven’t even got the most primitive skills for the crushing demands of fast-paced, game-changing program work. You’d have a better shot at winning the jackpot in Las Vegas. One thing many teams routinely overlook is this: business-critical programs must be done alongside delivering excellence in ongoing operations. Doing both through the functional organisation is virtually impossible. But many companies try. A: Briefly, functional structures were designed by the Ford Motor Company and General Motors, one hundred years ago, for two things essentially: repeatability and predictability. In cases where repeatability and predictability are needed, they can perform really well. But they were never designed for tackling business-critical programs which are anything but predictable. Back then, the stresses and strains of business–critical programs were never imagined or understood. There are basic irreconcilable clashes between routine business operations and business-critical programs. Management practice in routine business functions has virtually nothing in common with the management principles for running business-critical programs. Because they are mostly concerned with managing unknowns they are, by nature, volatile, chaotic and unpredictable. No matter how much senior management like to overlook this issue, these clashes are inevitable and guarantee the two are always in conflict. This fundamental reality goes to the heart of how organisations are designed, how managers are trained, how people behave – and how performance is measured. Q: Is this why you think functions quickly run into a brick wall with any program that’s not run-of-the-mill? A: Many executives argue passionately that it “ought to be possible” to run complex programs alongside BAU. I call them the “surely-it-ought-to-be-possible” brigade. But this is drive-by management. Theoretical drivel, based on little more than gut-feelings, half-truths and misconceptions. It’s always an opinion-based argument, mostly by people who don’t want to change and enjoy a debate for the sake of it; they’ve never successfully “done it” before. Q: What chance of success does a business-critical program have against BAU? A: Day-to-day tactical work always overshadows the change agenda. Programs the senior team say are crucial to the future success of the business are starved of critical resource. But actions don’t match the rhetoric nearly enough. This is a baffling contradiction. Essential change work is always put on the back-burner; teams are just too busy with other work. Unless programs are separate from normal operations, business-as-usual is king. That’s a fact. Over time, the logjam of “back-burner” work becomes so severe that BAU almost shudders to a halt – and a special recovery program is required to accelerate the essential change work that’s been moving at a snail’s pace for months. Q: Can you elaborate on how business-critical programs are typically resourced? A: Typically, organisations take the easy option and allocate a portion of existing resources’ time to the execution of business-critical programs. This creates a massive conflict for people around what they focus on. Do they focus on the program – or do they focus on their day-job? Without guidance, they will always tend to give priority to their day job. If programs are truly business-critical, you simply can’t expect to get program work done with slivers of people’s time. It’s an absolute fantasy. No amount of cunning wizardry can change that. And you certainly can’t get it done with processes and a management system (governance) that’s not as robust as normal business unit processes. Like you’d find in Finance, for example. The truth is most businesses don’t have a recognisable process for program execution. There may be a set of program management manuals somewhere, defining what the processes ought to be – but they’re rarely used. If you can’t describe what you are doing as a process, you don’t understand squat about what you are doing. Executive management constantly closes their eyes to this, accidentally or otherwise. Q: This is fascinating. You’re saying many businesses don’t use industrial-strength processes for program execution? A: No, definitely not. Most businesses don’t use rigorous processes for business-critical programs. They may even have spent millions developing theoretical processes on laminated cards but they are simply not used. Manuals are used as door stops – or for propping up screen projectors. Sponsors seem oblivious to it also, no matter how many times it has screwed up important programs before. This kind of circular cognitive dissonance sets companies back years. Usually, when people are asked to rate their business’ ability to craft strategy, on a scale of 1-5, (5 is high), most people would, without hesitation, score 4 or 5; they believe their business is good at generating ideas and strategies. But when asked to rate their business’ ability to convert strategy into concrete results, the score typically plunges to a 1 or 2; they believe their business is mediocre, or worse, at executing strategy. Q: So why is this? Is it because ideas are easy to come by and execution is hard? A: Execution is hard – but no harder than strategy. Making more coherent choices about where a business plays and how it will compete, sharpens execution focus. 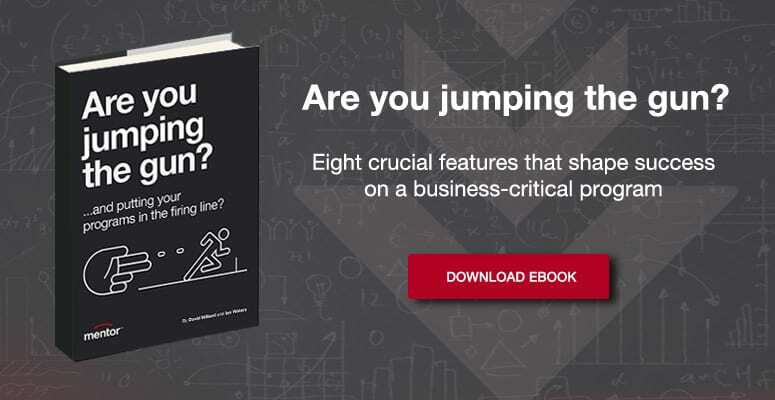 Better choices about target customers, propositions – and the superior capabilities needed to deliver those propositions – allows a business to consistently out-execute competitors with mediocre strategies. Strategy is a professionalised process in most companies; it’s well understood. But it’s not matched by a professionalised execution processes; they’re either sparse or non-existent. You can’t have good execution without good strategy. Exceptional results don’t come from execution alone. Compounding the problem, organisational choices for strategic programs are made by managers who don’t understand the practical challenges nearly as well as they should. Q: How could companies improve their approach to execution on business-critical programs? A: Well, let’s look at what usually happens. Boards crawl all over strategies before they sign them off, but they don’t pay anything like the same level of attention to how work will get done. This is a colossal mistake. The critical question the board should ask senior management is what type of program are we running? Is it regular or complex? Is it time-critical and cutting edge? What belief do we have about this program that isn’t true? If it really is a regular program, go ahead and run it through the functional structure. No problem. But if it’s a complex business-critical program, don’t kid yourself you can run it through BAU. Time to wise-up. You need a separate standalone team, a capable leader with their own resources, unconstrained by BAU management practices. Q: How does a standalone program organisation help with execution? A: You don’t get transparency from groups with blurred accountabilities when running critical programs with fragments of people’s time. It’s impossible to understand who is working on what – and for how long. What you get is vomit information. It would be easier to split the atom. For example, if someone is allocated to a program for 40% of their time, which 40% do you get? The 40% before they start their BAU job – or the 40% you get when they’ve finished their BAU job. It’s usually the latter, which means the 40% you thought you were getting never materialises. Who decides on priorities between BAU and the program? That’s correct it’s the individuals’ line manager – not the Program Manager. The Program always loses. It’s simply a convenient management illusion that causes bedlam where work actually gets done. Executive teams must be in a position to make informed decisions on priorities and resource allocation – with transparent data. Clarity fixes confidence. Transparency on business-critical programs comes from separate, standalone teams with true accountability. So, you can’t skate over it. If you don’t want permanent also-ran status, ask the key question. Is the program regular or complex? You’ll take a major step toward celebrating a rare program success if you answer this question frankly and honestly. But in itself, that’s not enough. You have to act decisively on it. The choice is literally the difference between playing checkers or chess. Even a brilliant checkers player will get wiped out using checkers rules to play chess. But that’s what too many executive teams do. Functional organisations are permanently resource-challenged – and creaking at the seams. How can it make sense to dump one or more, business-critical programs on top of their normal workload – and not expect serious consequences? Like unexploded ordnance, these traps remain buried just under the surface, for many months, before detonating out of the blue. Quite simply, organisation choices for strategic programs do have a dramatic impact on financial results. Literally, the difference between winning and losing.